Rochebonne means "good rock". The property is built on solid rock. Gardening is a non-event. We have lots of potted plants, flowers in tubs, and lots of small trees and shrubs whose roots struggle down through barely six inches of soil, through the rocks, to more soil and water beneath. Not a lot will grow. Worse, it takes just a bit of a high wind and the trees, their roots shallowly spread out over what little soil there is, soon uproot and come tumbling down. My lovely old daddy, who that year would have been 82, pointed out the one and only place where the pool could go. Oddly enough, on both the chateau side and the cottage side, the only deep soil is in the north-east sector of the grounds. So that is where the pools went, both sides. Annoyingly, just the other side of the wall, in the woods belonging to the neighbour, there are tall trees which, in turn, means deep soil. 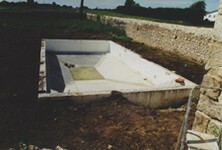 We did a lot of the work on the first pool ourselves. Needs must and all that. It was back-breaking and tedious work. Mercifully it didn't rain and it didn't get too hot. When we did the cottage pool, over double the size, we got contractors in. There are so many rules and regulations associated with pools and the public that it many ways it is tempting to not have a pool at all. The British in particular (and the French will soon follow, as they do) have copied the Americans in their love affair with suing for anything and everything. Keeping on the right side of the law while providing a lovely place for guests to swim and sunbathe is a feat in itself. I had to dive in after a child on one occasion and on another I mentioned to the Dad of a young brood that he needed to remember to shut the gate properly. He said: "Well, you should get a better shutting mechanism!" "The best shutting mechanism in the world," I replied, "is called GROWN UPS!"